Businesses in the Northern Isles will benefit from further improvements to freight shipping as a contract has been awarded to Shetland Line (1984) Ltd. The contract is for a lift-on - lift-off (lo-lo) freight shipping service, in a move aimed at securing freight operations for the islands. "These freight services are absolutely vital to the Orkney and Shetland Islands' economies and I am delighted that we have managed to secure them for the next six years. "This contract will bring many benefits to Northern Isles businesses, providing an efficient and effective shipping link for goods to be transported to and from the mainland. "This contract is the latest stage in our strategy of improving transport links to all our island communities. Local people and businesses deserve the best possible transport links to the mainland, and I am pleased that this contract has been delivered." The service requirement is for two round trips to Orkney and Shetland per week on the Aberdeen - Kirkwall - Lerwick route. Up to a set limit, subsidy will be paid on each tonne carried. The amount of subsidy will depend on the level of usage, expected to be around £600,000 in the first year of the contract. The new contract will start from May 31, 2008. A competitive tender for a lift on - lift off freight service was issued on March 28, 2007. The procurement for a public service contract follows the terms of the EU Maritime Cabotage Regulation and EU Guidelines for State aid in the maritime sector. The assistance applies only to the shipping service. The contract is for a six year period. Shetland Line (1984) Ltd is part of the Streamline Shipping Group Ltd.
Banff & Buchan MSP Stewart Stevenson has joined the campaign to protect people from cowboy builders and rogue tradespeople by backing the TrustMark scheme. TrustMark is an award winning scheme supported by the government that helps householders find reliable and trustworthy tradespeople to carry out all forms of household repairs and improvements. The TrustMark initiative, backed by the building industry and consumer protection groups sets standards with regards competence, financial standing and fair and independent redress mechanisms and aims to give consumers the confidence they need when looking to hire a trustworthy tradesperson. “Rogue tradespeople working in the domestic repair, maintenance and improvement sector have an overwhelmingly negative impact on consumer confidence within the industry. “When we hear the horror stories of constituents paying way over the odds for work that is either not done or not completed to a satisfactory standard it makes us look with distrust on those working within the building industry, the vast majority I might add being hardworking honest individuals. “While Banff & Buchan I am pleased to say has a good reputation for honesty and hard work within the building industry it only takes one bad apple to cause lasting damage to someone’s home and sour the public's image of the entire industry. Banff & Buchan MSP Stewart Stevenson has welcomed action taken by the Scottish Government to protect the charitable status of Banff & Buchan College and other Further Education institutions throughout Scotland. The announcement was made by First Minister Alex Salmond, who said that an order has been laid in the Scottish Parliament to protect the charity status of colleges. This will come into effect subject to Parliamentary approval later in the year. The announcement follows a review last year of the College by the Office of the Scottish Charity Regulator, which found that Ministerial powers to direct further education colleges were inconsistent with the requirement that charities should operate independently of government. This meant that, without action by Ministers, colleges would lose the right to charitable status. “Banff and Buchan College plays a vital role in developing the skills and knowledge base of a large section of the local community. Today's order is aimed at ensuring the climate remains such that education institutions can continue to do what they are best at, training and educating the local population. “Scotland has a long history of promoting education amongst its citizens and of giving education authorities the freedom to teach as they see fit. By allowing colleges to get on with their crucial work we can improve the educational and life opportunities for current and future students. "I am delighted that the First Minister has recognised the contribution colleges across the country make to building a smarter, wealthier, fairer Scotland. This move to protect the charitable status of Banff and Buchan College and similar institutions around the country will help deliver those aims for the benefit of all." Banff & Buchan MSP Stewart Stevenson has backed calls for the UK Government to ensure that rural consumers who rely on home fuel oil or bottled gas are given the same rights as gas and energy consumers. While many rural consumers use home fuel oil and bottled gas, there is no regulator given the task of looking at the market or interests of consumers who use these types of heating fuels. With consumers suffering massive rises in fuel prices for heating there is a need to create the same level of regulation for fuel oil and bottled gas suppliers as there is for gas and electricity suppliers. "Both Ofgem and Energywatch have confirmed that there is no regulator with the task of looking at the market or interests of consumers who use home fuel oil or bottled gas. They do not even have the limited protection available to gas and electricity consumers and this is completely unacceptable. "Prices of essential energy supplies have risen dramatically, causing real financial hardship in rural Scotland. It is essential that action is taken to end this anomaly and look clearly at this market. "I am pleased to say that thanks to the hard work of the SNP's Westminster Energy Spokesperson Mike Weir we are finally seeing this issue on the political agenda. "With Energywatch set to be subsumed into the new National Consumer Council, Mr Weir has been pressing on whether the energy section would include this area. While he was told that Energywatch would press for that to be included, the political representative of rural Scotland need to ensure that this is taken forward and remains on the political agenda. "It is vital that the UK government acts to ensure that this part of the energy industry is included in the remit of the new National Consumer Council and we will working hard to ensure this is the case." More than 400 lorry journeys a week are to be cut from Scotland's busy road network following a funding announcement to cut congestion and reduce emissions. Over £3 million of funding has been allocated to two haulage companies for the provision of two new freight rail services from the central belt to Inverness. Eddie Stobart Limited will receive up to £982,000 of funding from two grant schemes to help fund a new rail freight service transporting Tesco goods between Grangemouth and Inverness. John G Russell has been awarded up to £2.1 million in two separate funding allocations for a new Coatbridge to Inverness rail freight service. "As a Government we are committed to getting more freight off Scotland's roads and onto rail and water. By taking more lorries off our roads this funding will help ease congestion and reduce damage to the environment. "Many of us have experienced congestion on roads such as the A9. These awards will help free up traffic flow on the A9 and reduce emissions. "This funding will remove 3.17 million lorry miles from Scotland's roads a year and deliver £6.3m in environmental benefits over the next five years. "Projects such as this make an important contribution towards achieving our ambitious target of reducing Scottish emissions by 80 per cent by 2050. This target is twice as ambitious as the UK target and signals Scotland's serious intent to lead the global effort to combat climate change. "Tesco is committed to helping the environment and by moving this freight onto rail it is estimated we will save over 13,000 road journeys a year. This shows just how ambitious Tesco is when it comes to cutting our environmental footprint, while delivering the very best for our customers. "I am delighted to officially open the distribution centre in Livingston and to see for myself the real benefit for Tesco customers, who will now be able to take advantage of increased product availability and wider ranges of both local and national goods." The REPS grant provides operating subsidy to companies who wish to transfer freight from road to rail where the rail option is more costly. The award to Eddie Stobart Ltd includes £525,000 of Freight Facilities Grant Funding (FFG) for the provision of 70 new curtain sided inter-modal units and £457,000 of Rail Environmental Benefit Procurement Scheme (REPS) funding to help with the running costs. John G Russell funding package includes a £1.84 million FFG towards the capital costs of terminal works in Inverness and intermodal containers for a rail freight service. In addition they will receive £257,975 of REPS funding to help the running costs of the new service. This builds on the very successful Stobart/Tesco Daventry-Grangemouth service launched in 2006 with FFG support from the Scottish Government and REPS support from DfT and the Scottish Government. Minister for Transport Stewart Stevenson today visited Harthill Services to mark the start of work on a new footbridge spanning the M8 to create a striking new landmark in the central belt. This £5.1 million Transport Scotland project will replace the existing Footbridge and provide much-needed access improvements for the Heart of Scotland (Harthill) Services. and the Local Transport Interchange (LTI). These facilities are being well used and will benefit from the much improved footbridge when constructed, for better public transport use in the Central Scotland area. Passengers using the LTI have benefited from additional car parking provision on the south side of the motorway, which is frequently used by commuters continuing their westbound journey by bus and eastbound travellers crossing the existing footbridge to use the Edinburgh bus service. "I am delighted to see work start on this new bridge that will improve access to services here in the heart of the Scotland. The existing footbridge has been a recognisable feature for Scottish motorway drivers for nearly four decades but it is showing its age and acts as a barrier for many people in the local community who have accessibility needs. "While this investment recognises our commitment to improving accessibility on the transport network I am also pleased that the chance has been taken to build an visually impressive landmark for one of the country’s busiest routes." Acting on Transport Scotland’s behalf, contractor Raynesway will construct the new 63-metre footbridge which has a novel design formed with intertwining steel spirals, known as a ‘helical truss’, that enclose the glass-sided walkway. Harthill was the first motorway service station to be built in Scotland following the completion of the M8 in the early 1970s. The new footbridge will complete the redevelopment of the Harthill site, which includes the recent Transport Scotland investment in a new £1.1m transport interchange. Banff & Buchan MSP Stewart Stevenson is campaigning to highlight an extension to a scheme that helps households and businesses get government help to access Broadband services. Recognising the importance of access to broadband the Scottish Government launched 'Broadband Reach' last October. The scheme aims to give support to those households and businesses previously unable to access broadband.To benefit from Broadband Reach, households and businesses need to register their interest. While the initial closing date for registration was 18 January the Scottish Government has continued to accept applications while running a procurement exercise for contractors to deliver the scheme. Last week (8 May) in the Scottish Parliament, Jim Mather, Minister for Enterprise, Energy, and Tourism, announced that the procurement programme is ending and announced a further extension of the deadline for applications to the end of May. "In an increasingly digital age, the term global village is one that has become an apt description of how through internet access and other digital technologies people from other sides of the world can disseminate and communicate information within seconds. “Having access to Broadband is a critical business tool and vital for households to access a wide range of information and services. Households and businesses in some rural areas have faced great difficulties in accessing broadband, threatening to place them at a disadvantage in the digital age. "However through the Broadband Reach programme the Scottish Government is aiming to ensure service for all geographic regions irrespective of local demographics and is to be congratulated on the flexibility they have shown in keeping this scheme open. Hundreds of residents from across Central Scotland gathered at Alloa station today as the Stirling-Alloa-Kincardine railway line re-opened for the first time in over 40 years. Transport Minister Stewart Stevenson joined local people of all ages as they climbed aboard a steam train to celebrate the culmination of eight years work to re-establish the rail line. It is the first time a passenger train has been seen at Alloa station since it closed in 1968. "This is a fantastic day. It has been a long time coming, but after 40 years we can now all look forward to passenger trains travelling through Alloa station once again. "This is one of the most important infrastructure projects Scotland has seen in decades, and the significance of this project extends beyond Stirling, Alloa and Kincardine. The whole of Scotland is set to benefit. "This is a vital new link which will provide improved links to education and employment opportunities for communities across central Scotland, promote inward investment and increase sustainable economic growth to the area. It will also bring faster, more efficient freight routes for businesses, taking more lorries off our roads and onto rail. "This project has not been without its challenges, but we should celebrate a great day for the people of Alloa who can now look forward to much improved rail connections. "Transport Scotland have done a good job since taking the reigns of this project last Summer." "Clackmannanshire Council has campaigned for decades for the reopening of the rail link, and I would like to thank the many officers who have played a part in making this come about. The Council's consistent involvement was key in drawing together the complex planning, building and legal issues in this massive project. Indeed, the first private rail bill ever approved by the Scottish Parliament in 2004 was lodged by the Council. "The railway will breathe new life into Alloa and Clackmannanshire, encouraging businesses and jobs while providing our citizens with convenient, safe and fast public transport to Stirling, Glasgow and Edinburgh. I look forward to using the railway for many years to come." The historic occasion was marked in style as guests travelled from the newly built Alloa Station for a return trip to Stirling Station aboard a steam train hauled by The Great Marquess 61994, a majestic locomotive built in 1939. Among the invited guests were employees of the previous railway which closed to passengers in 1968 and over thirty schoolchildren from local Primary and Secondary schools. With passenger services due to commence on Monday 19 May, the reopening is another important part of Transport Scotland’s programme of investment in major rail infrastructure, creating high quality public transport links across Scotland. The project has reopened approximately 13 miles (21km) of existing, disused and abandoned railway line between Stirling Station and Longannet Power Station in Kincardine. The new station at Alloa allows direct hourly passenger services between Alloa, Stirling and Glasgow Queen Street and onward services from Stirling to Edinburgh. The line will also provide a more efficient freight route to carry coal from the West of Scotland to Longannet Power Station and potentially provide freight services to other customers along the line. This route will allow freight trains to be diverted from the existing, longer route via the Forth Bridge, and thus release capacity for improved passenger services. Banff & Buchan MSP Stewart Stevenson is encouraging Armed Forces and Merchant Seafarers Veterans from the surrounding area to apply for the HM Armed Forces Veteran's Badge and the UK Merchant Seafarers Veteran’s Badge in recognition of their contribution to their country. The HM Armed Forces Badge was launched in 2004 to recognise all military service and act as a means of raising public awareness of veteran causes and generate a sense of unity amongst all generations of Armed Forces' Veterans living in our communities. A separate UK Merchant Seafarers Veterans' Badge was introduced, in 2006, as a special version of the HM Armed Forces Veterans' Badge to reflect the unique relationship that the Merchant Navy and fishermen have held with the Armed Forces over the years. “Veterans are a very special and diverse group who deserve our respect and appreciation. They have worn the uniform with pride and they have honoured their commitment to defend our interests. Many continue to make a major contribution to their communities well after leaving the armed forces. I hope the younger generations will look upon our veteran community and draw inspiration from their many achievements. "The badge represents a token of appreciation, respect and gratitude for the ex-service men and ex-merchant seaman and women who have been prepared to lay down their lives to protect this country. With Veterans' Day fast approaching, I am trying to encourage everyone who served in the armed forces to claim their Veteran's Badge from the Ministry of Defence. "Banff & Buchan has a long, rich and proud military and seafaring heritage. The many heroic acts and sacrifices of the men and women of Banff & Buchan, be they ex serviceman, merchant seaman or fisherman must never be forgotten. It is important to remember the sacrifices of this generation and the next. I'm very keen that all those entitled to apply for a badge do so at the earliest opportunity to create an increasing sense of unity amongst our veterans across all generations." If you think you might be eligible to apply for a badge please call my Peterhead Constituency Office on 01779470444 to receive an application form or write to Stewart Stevenson MSP, 17 Maiden Street, Peterhead, AB42 1EE. "Further information on the Veterans' Badge, along with help and advice on any issue affecting veterans' lives, can be obtained from the free national veterans helpline 0800 169 2277. Banff & Buchan MSP Stewart Stevenson today welcomed the announcement that the SNP Government will implement a five point action plan to help the Scottish fishing industry counter the effects of rising fuel costs. “Increasing fuel prices is having a serious detrimental effect on the viability of our fishing industry and this issue is one which is being dealt with through effective communication with our fisherman and their industry representatives. “With recent renowned confidence in the industry, reflected in Fraserburgh leading the way in white fishing sector, the SNP Government has acted quickly to implement this action plan which aims to both address short term issues and look for long term solutions. "We must work with both the UK and European Governments to ensure our fishermen’s needs and concerns are fully acted upon in these difficult times. Mr Lochhead has assured me that the Task Force is to be radical in its thinking so we can all ensure a sustainable and profitable future for the Scottish fisheries sector." "The Task Force will report by the end of August on steps to be taken in response to the fuel price increases and by the end of February on longer term issues. The membership and remit of the Task Force will be agreed at the Scottish Fisheries Council meeting on May 13 while the fuel efficiency scheme will available from early September." The commitment to PE is prominent in the draft Health and Wellbeing outcomes published as part of the new teaching and learning guidance under Curriculum for Excellence and is seen as a tool to tackle childhood obesity. "Making PE compulsory in our schools for a minimum of two hours a week will give children and young people an important foundation for participation in experiences in physical activities and sport in preparation for a healthy and fulfilling lifestyle. “Physical activity and sport will take place, in addition to planned PE sessions, at break times and lunchtimes and beyond the school day which will act as an important tool in fighting against childhood obesity. "Taken together, the experiences and outcomes in physical education, physical activity and sport are intended to establish the pattern of daily physical activity which, research has shown, is most likely to lead to an active and healthy adult life. A framework to support increased sustainable economic growth in West Edinburgh has been published today by the Scottish Government. "Scotland's planning system should be an aid to support sustainable economic growth while protecting the quality of the natural and built environment. "A planning and development regime which is joined up, combining greater certainty and speed of decision making can benefit everyone in Scotland - not least the business community. "West Edinburgh is a key area in helping to create a more successful country, providing opportunities for all of Scotland to flourish. "The West Edinburgh Planning Framework recognises the need for Edinburgh Airport expansion, the importance of the Royal Highland and Agricultural Society and the role of the International Business Gateway in helping to give Scotland a competitive edge and is consistent with our ambitious climate change targets. "Individual planning applications will still have to be judged on their own merits, however, this framework supports the principle of these developments and recognises the associated benefits for the local and wider economies." "West Edinburgh is the principal gateway to Scotland's capital city. It is a top European investment location of increasing economic significance. It boasts a rapidly growing international airway, the global headquarters of major financial services and a high share of new technology and growth services. "It is essential that the framework capitalises on West Edinburgh's success and provides for continued economic growth for the good of Scotland. The framework must further the competitive advantage of one of Scotland's key strategic economic development zones and maximise its national and international connections." "We welcome the new West Edinburgh Planning Framework. Expansion of Edinburgh Airport will greatly benefit our own local economy and help attract more visitors to West Lothian. The creation of an International Business Gateway so close to West Lothian could also provide spin-off benefits for our own area." "The West Edinburgh Planning Framework is a key step towards the development of a wider east of Scotland economic zone that will provide an attractive location for companies seeking high quality accommodation in a high quality location. It will provide a vibrant hub which is expected to attract over a billion pounds of investment and thousands of new jobs over the next 20 years or so. "Working closely with the Scottish Government, Edinburgh City and West Lothian Councils, Scottish Enterprise has been charged with establishing and leading a partnership which will turn the vision into reality. We are proud of this endorsement of Scottish Enterprise's role in delivering major economic development projects of national importance. It is a challenge we relish." The West Edinburgh Planning Framework 2008 updates the previous framework, launched in 2003. WEPF has the status of a Scottish Planning Policy and will be a material consideration in development planning and development planning decisions. It has been prepared on a partnership basis with Scottish Enterprise, the City of Edinburgh Council and West Lothian Council. A consultation on WEPF was launched in November 2006. More than 70 responses were received. All responses have been taken into consideration in preparing the final Framework. The WEPF tasks Scottish Enterprise with facilitating the establishment of a Partnership of key public and private players to co-ordinate action and investment of the area. Transport Minister Stewart Stevenson today visited Tayside traffic police to hear their views on the future shape of a new 10 year road safety strategy for Scotland. The Minister also took part in a routine traffic patrol to experience at first hand the important work of traffic officers. Mr Stevenson said that those on the front line of response could provide a unique insight into the tragedies being experienced by too many families across the country. "The police are the front line. They have to deal with the horrific consequences of lives being lost on Scotland's roads. "Often first on the scene, they witness the needless tragedy, the heartache, and sadness. They witness the agony as they have to carry out that awful task of telling a family that a loved one has been lost. "These police officers have a unique insight into road traffic accidents. It is an insight which could help us save lives. "That is why I am here today, and that is why the Scottish Government is looking to develop a new 10 year road safety strategy for Scotland. "Last week, we saw the Westminster Government consult on plans to change UK-wide legislation on driving and testing. I welcome that. Legislative change can deliver real improvements. But this Scottish Government will also do whatever it can within our own devolved powers to make that difference." Latest road accidents statistics showed that there were 314 deaths on Scotland's roads in 2006 - 10 per cent more than in 2005. There were also 14 more child deaths than in 2005. The Transport Minister recently brought together an expert group on road safety from across Scotland. It is made up of some of the leading thinkers in road safety from across the country, including the police, road safety experts, a driver behaviour psychologist, the Children's Commissioner, and others. The group's remit is to give their views on how to improve road safety in Scotland. Their views will help inform a new 10-year road safety strategy for Scotland. The Scottish Government is also looking at more innovative ways of improving road safety. Before Christmas it launched a new initiative involving XBOX games in Scotland, beaming anti-drink drive messages directly into the game. Banff & Buchan’s Westminster and Scottish Parliamentary representatives, Alex Salmond and Stewart Stevenson hosted p6 pupils from Easterfield Primary. After sitting in the chamber for First Minster Question Time they got to hold their own Paxman style interview with both Alex Salmond and Stewart Stevenson. “I am delighted to have had the chance to welcome Easterfield Primary to the Parliament and to meet with local pupils from my constituency. It is an excellent idea for students to visit the Scottish Parliament, meet with MSPs and witness at first hand how the Scottish political system works. 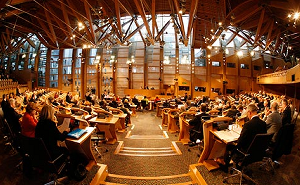 “I took the opportunity to explain some of the procedures of Parliament to the group and describe the average working day of an MSP and indeed a Minister before answering some questions.The experience was not entirely different from taking questions in the Chamber, certainly a good reflection on these students. “I was highly impressed at how well informed, articulate and assertive this group of young people showed themselves to be. From knowing the role of the presiding officer to the number of MSP’s that work in the parliament I would not be surprised if they had a better understanding of the workings of the parliament than many adults. “Despite an early start to make the trip to Edinburgh they showed a real enthusiasm for their surroundings.They had prepared some tough questions for me and unlike those from Wendy Alexander they proved to be entirely relevant to my role as First Minster. After meeting the two political representatives of Banff & Buchan the Easterfield pupils were taking for a tour of the parliament building before heading off to Dynamic Earth were they ended their school trip to the capital city. Banff & Buchan MSP Stewart Stevenson today welcomed the announcement of a new dedicated fund for Scotland's war veterans. The Scottish Veteran's Fund marks for the first time, direct investment from the Scottish Government in services for ex-servicemen and women. Totalling £127,000 over the next three years, the fund is designed to recognise the contribution that veterans have made and continue to make to Scottish society. “The Scottish Government has never previously provided dedicated funding for veterans' issues within Scotland and we felt it was necessary to rectify this so as to ensure additional support could be given to our war veterans. “While the vast majority of men and women who leave the armed forces have a seamless transition back into civilian life this is not the situation for everyone. “Sadly the strains and stresses that can result from military duties can lead to difficulties when reintegrating into society. “We in the SNP Government want to create a multi-level safety net for our veterans and look at measures that give them the necessary aid to enjoy civilian life. “One part of this multi-level approach was introduced last year Health Secretary Nicola Sturgeon announced that veterans were to be given priority on the NHS to treat problems arising from their military service. Banff & Buchan MSP Stewart Stevenson this week celebrated the SNP’s first anniversary in power and promised not to rest on his laurels in representing the interests of the people of Banff and Buchan. “We came to power last May because the people of Scotland wanted change and they wanted a party that would stick up for the interests of Scotland. By voting the SNP into power, Scotland now has a government that is listening to the electorate and working harder than ever to deliver for each and every constituency in the country. “This basic fundament of being a political representative had been lost on the previous administrations and one which is still ignored by those in power in Westminster. In our year in government we have looked to bring in policies that will bring a real positive change to the lives of the people of Scotland. ”Speaking to the constituents in Banff & Buchan It has been policies such as the reduction of prescription charges, the increase in free personal and nursing care payments, the freezing of the council tax and the abolition of the graduate endowment that have been welcomed the most. These policies are ones that have intended to see many of our most vulnerable individuals benefit as a direct result. "As we continue to move Scotland forward we are looking to protect our rural heritage, our farming and fishing industry and work hard to ensure the Scottish Parliament and Government reacts to the best interests of our constituents. Banff & Buchan MSP Stewart Stevenson today called on the Labour Government to act on the recommendations made by Lord Sutherland that Westminster should reinstate the £30m a year in attendance allowance for elderly people in care homes. An independent review of the Free Personal Care scheme, conducted by Lord Sutherland, has concluded that Scottish Government "should in the short term seek the reinstatement of the £30 million in attendance allowance", which was withdrawn by the Westminster Government when the scheme was introduced. Attendance Allowance is a tax-free social security benefit paid to people over the age of 65 who need help with personal care or who need a lot of looking after. It is intended as a contribution towards the extra costs faced as a result of being physically or mentally disabled. With the introduction of the Free Personal and Nursing Care policy in Scotland in July 2002, the allowance was withdrawn from individuals in residential care who had all their disability-related needs met by that care. Approximately 8.5% of the 35,806 people aged over 65 in Aberdeenshire, [around 3,000] are entitled to free personal care. On that basis, the Council would be entitled to some £1.26 million in Attendance Allowance funding that is currently being held back by Westminster. "The Free Personal and Nursing Care policy was supported by all parties of Scotland, and has been of huge benefit to older people in Banff & Buchan. "All political parties should now come together to support the recommendation of the Independent Review that Attendance Allowance funds, held by Westminster, should be reinstated. "Older people across Banff & Buchan are losing out to access to some £1.26 million allocated to Aberdeenshire council because of the UK Treasury's unwillingness to return this money to Scotland. "The Scottish Government has already taken steps to improve the delivery of free personal care and has increased free personal care and nursing payments for the first time since they were introduced. "This should not be a party political issue; it is about what is right for vulnerable older people in Banff & Buchan and across Scotland." Stewart Stevenson, Minister for Transport, today announced the appointment of a new Convener for the Public Transport Users' Committee for Scotland (PTUC). James King has been appointed convener. Mr King served on the Rail Passenger Committee (Scotland) prior to its dissolution in 2005 and now represents Scottish and passenger interests on the boards of Passenger Focus, and the British Transport Police Authority. He was previously Vice Chair of Rail Action Group East of Scotland and has been a member of the PTUC since its first meeting in April 2007. This appointment will be for three years and will run from May 1, 2008 to April 30, 2011. This post is part-time and attracts a remuneration of £150 per day for a time commitment of two days per month. Mr King was appointed by Scottish Ministers as the Scottish Member of the Rail Passengers Council (which operates as Passenger Focus) in 2005. The Rail Passengers Council post attracts an annual salary of £15,300. The PTUC was established by the Public Transport Users' Committee for Scotland Order 2006. It is an advisory public body which came into being on 01 January 2007. The PTUC considers and make recommendations to Scottish Ministers relating to public transport services in, from and to Scotland and considers and makes recommendations about other matters when asked to do so. The PTUC will operate under the more user-friendly name Passengers' View Scotland. This Ministerial public appointment was made in accordance with the Commissioner for Public Appointments in Scotland's Code of Practice. All appointments are made on merit and political activity plays no part in the selection process. However, in accordance with the original Nolan recommendations, there is a requirement for appointees' political activity (if there is any to be declared) to be made public. James King undertook no political activity in the past five years. Mr King was previously the Deputy Convener and succeeds John Elliot who resigned from the post on health grounds in April. The European Commission Vice President for Transport was today welcomed to Scotland. It is the first time Vice President Jacques Barrot has visited the country in his official capacity. Scottish Ministers will be hosting a dinner at Edinburgh Castle in honour of Vice President Barrot later this evening. "Jacques Barrot is a highly influential figure within the European Commission and I am delighted to welcome him to Scotland. "This Government places great value in working closely with the key EU Institutions. We want to strengthen and build on our existing relationships with the Commission and I am looking forward to sharing views and experiences with Vice President Barrot. "With us both having a shared interest in transport, I am sure we will have much to talk about. "There are issues I am keen to discuss with him, such as the recently announced EC investigation into ferries. Although this investigation covers the terms of previous administrations, I am pleased to have the opportunity to talk about the way forward in the years ahead. "This is Vice President Barrot's first official visit to Scotland and I am sure that he will be hugely impressed by our fantastic country." Jacques Barrot was appointed European Commissioner for the period 2004 to 2013. Prior to this, he was head of the French President, Jacques Chirac's UMP Party in the National Assembly. He has a political background at local and regional levels as well, as a Member of the Auvergne Regional Council - from 1976 to 1986 - and as Mayor of Yssingeaux, from March 1989 to March 2001. He is currently Vice President for Transport. During his visit Vice President Barrot will visit the Scottish Parliament, the Forth Road Bridge, Ferrytoll Park and Ride in Inverkeithing, and Edinburgh Airport.